hope you had a wonderful start into 2019! All the best. I sure did – also from an augmented reality point of view, I was pleasantly surprised. During this year´s consumer electronics show (CES) we not only saw a lot of VR fun (will VR glasses on my backseat help to lower my motion sickness?) or other fun gadgets like roll-up TVs, but also some new players or new releases in the realm of smart glasses. Time to sum it up and give my two cents. Feels like 2019 could be the year, AR glasses get their consumer breakthrough kick-off attention. Let`s jump in! During CES you would expect more consumer-focused gadgets of course. Still, there was a mix to be seen and sometimes you had the feeling to choose between two categories: either “bulky and ugly but powerful” (B2B) or “pretty but lame” (consumer). We could see some new players, but also a list of well-known players. E.g. 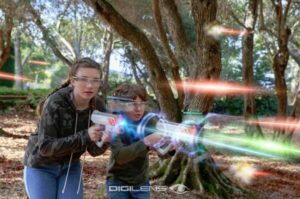 some fun news like the “musiclens” audio AR glasses with bone conduction for your whispering helper voice in your ear. I won´t go through all glasses today as most fall into one of the categories. Be it Focals, Dreamglass, Aurora, Lumus, Golden-i or the Vuzix Blade. We can see a trend towards next gen AR glasses. 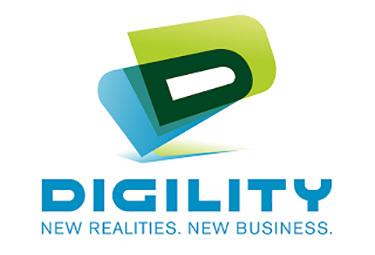 One of the very slim and light devices was the Digilens Crystal. The glasses itself weigh “less than 85 grams” (so probably 84 grams) and let you connect your smartphone via an usb-c cable. The heavy weight is taken away from your head (like Magic Leap did half-assed). Currently the glasses reference design shown only comes with a screen on the right eye (30°fov), but CEO Chris Pickett speaks of 120° and more in stereo soon. They currently seem to focus on development of an updated waveguide tech, that works better for glasses – without dimming them down through dark shades. The Crystal (hence the name) shows a clear reality. During CES it seems there was not much to see yet. Only smartphone content mirrored to glasses and floating windows in 2D. This matches the “pretty but lame” bucket for now, but hopefully there is more to come. They partnered up with Niantic, so maybe a future update could bring us more gaming fun outdoors. If they manage to fulfill their promise on a larger daylight, bright field of view: worthy to follow! Thirdeye for your rugged working class tasks? On the other hand we see continued B2B glasses designs like the Thirdeye X2 (I always think of Triclops from the Masters of the Universe here, damn, probably my generation`s fault). The claim to have the smallest mixed reality glasses. Tech specs come with 42° diagonal field of view, 1280×720 screens, a bunch of sensors for 3D scanning, thermal sensors or GPS and brings other production line-worthy features like a dual battery system for hot swapping (nice!). But then again, they look a bit like a foamy prototype with a bulky design that feels like putting blinders to your worker`s eyes. They do promise a lot with the typical uses cases for remote assistance, hands-free instructions and more coming Q3/Q4 2019 for USD 1900. Kind of special interest for your industry. A surprise hit for the testers at CES was the “Qian” glasses from Realmax, because they come with a strong and crisp image at an awesome 100,8° field of view for AR. They are all-included glasses where you wear all tech on your head (and mostly your forehead). They look rather bulky and dorky to be honest (sorry), but the one who wears the device might not care. Their CTO Nigel Burton states, they will be going to production now and will cost less than a high-end phone. The former Microsoft engineer learned some lessons and created a great dev kit for research labs from my point of view: allowing 6DOF tracking, webGL, Unity and Unreal support, a Snapdragon 835 to power the graphics and a usb-port to connect external stuff. All testers seem to confirm the great visuals and field of view… but that`s for a lab. I don`t see a real world productive or consumer use case where I want to attach a Leap Motion for hand tracking via velcro to the top. Feels like a good toy for us tech nerds, but I don`t see it rolling in big numbers from the production line this way. The Chinese company exists less than two years, but their hardware design feels rather “adult” and well done. The pocket computer titled “toast” uses a Snapdragon 845 and gives you three hours of AR fun, they claim. It`s small and handy. It´s also a nice detail that your are able to connect the 3DOF controller “Oreo” by a magnet to the toast. Having only one cable going to your glasses feels like a relief (the thick Magic Leap cables annoy me all the time), too. They support Unity and Unreal like all and will allow you to connect your PC or USB-C-enabled phone of the future to it (replacing the toast). nreal aims for a price point of USD 1000 in Q3 2019. Overall, nreal was still my personal winner during CES. Probably I wouldn`t spend the money yet, but it feels like they show a smart update to current players putting some new ideas to the playground. The 3DOF controller sure is lame and the field of view (the usual pretend-culprit for “why AR fails”) could be bigger. 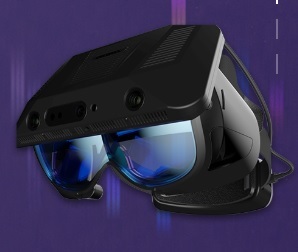 I hope I can try them out soon to see if my personal fov is blocked by the tech bar hidden behind the shades and if tracking is worthy of a follow-up. It feels, there is still a lot to try out and research reg. form factors, how to squeeze all into a device, how to survive battery lives and neck problems. The trends really seem to manifest in these two ways of special interest B2B and slim consumer gadgets. With more emerging players it feels like we are closer to hitting a critical mass that someone MUST win and do the turn-over. For the consumer side the USB-C-connected pocket device is the best choice in my opinion. All these simpleton glasses showing only a 2D hud or really really low poly stuff in 3D don`t have a reason to exist in my eyes (or in front of my eyes). If I wear AR glasses, all the visuals must be embedded into my 3D space. I won`t accept floating windows attached to my head. I`m not a borg. In general, I believe people would not accept this outside of special work tasks (like an amazon picker). We don`t like having our view blocked by anything and are very sensitive regarding disturbances in our field of view. Even the slightest minor peripheral movement gets our attention by nature. There is nothing else as hard to design from a UI point of view as AR rendering in front of our eyes! Having something attached to our heads would piss us off over a full day for sure. Hence, all AR needs to be integrated naturally in 3D and be persistent and consistent with the environment. Only then, AR can really shine and unfold for us consumers! So, the pocket device approach is the best we can do for now. Even Magic Leap is starting mobile phone dev now (to connect your existing device with the ML Two?). Remains the question of interaction. This is still not solved by the slim glasses section, unfortunately. nreal comes with a lame 3DOF controller, others only with swipe-touchpads on the glasses´ frame or speech control. But to continue the above vision of a natural AR: we urgently need 6DOF gesture interaction or 6DOF controllers. We cannot transfer the point-and-click metaphor from our PCs or phones to AR. We must have the full package to convince consumers. If we must explain UIs to AR glasses users (without seeing what they see): we are lost. I like the ring clicker from Focals AR glasses a lot. Maybe someone could combine this with a 6DOF hand tracking? Then we would have some device to click (and possibly vibrate for feedback), that is comfortable to wear and easy to use. The HoloLens clicker confirmed for me: we need some small remote control! People are lazy or uncomfortable to raise their hands or voice to interact. The company that first gives us a 6DOF tracking AND interaction with nreal-sized glasses will prevail! The Future in 2019 and beyond? But if we continue the thought above: being able to connect AR glasses via USB-C to our phone (or future gadget) we might even be able to swap glasses from different manufacturers and run the same apps. If Google or Apple extended their ARCoreKits to support AR glasses renderings, this could already do the trick for 2019 baby steps. Then we could move forward with slim glasses and do field tests with pocket snapdragons boosting our AR fun outdoors. Over the long run I`m still hoping that we all get an open standard done for hardware interoperability and spatial mapping and world references. Oh well, we`ll see. If we would reach that level of compatibility (dreaming on), the company with the strongest software platform would win. Only stepping into the third week of 2019 it already feels like there is a lot more to come this year. With CES revelations I have a positive feeling that we will see more movement on the market and many more lessons learned to push development. I don`t believe in an AR spatial cloud and all the above wishes just yet to be squeezed into my consumer AR glasses until Q4, but the tracks are better defined and failures understood. With this, I`m really looking forward to MWC in Barcelona in February – where we might see some big news from Alex Kipman and his HoloLens team! We also discuss the new AR glasses from CES in our latest VRODOCAST podcast (in German). Feel free to tune in and comment. We always love to get your feedback and start a discussion on mixing the realities!